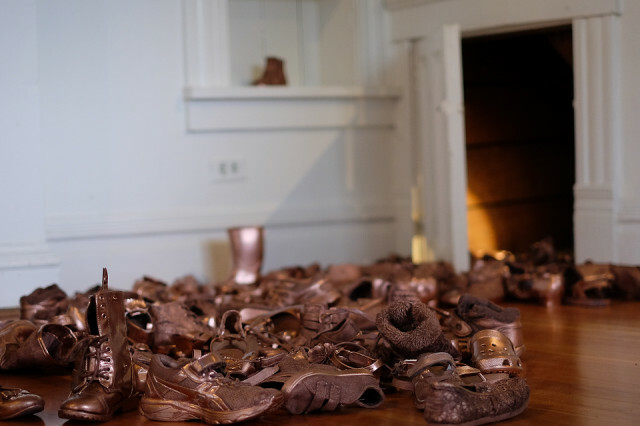 I've spoken before of Aimee Sitarz and her bronze shoes--evoking both the bronzed baby shoes popular with middle-class families in the 1950s and the horrible scenes of abandoned shoes near the concentration camps of the Holocaust. 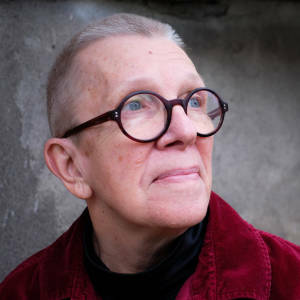 The two ideas come together in Aimee's imagination because she wants us to remember the children incarcerated by the Trump administration immigration policies. So she keeps on making "bronze" shoes and hanging them in public places, to remind people. Right now she has a gallery show, and I went with her to make some photographs of it; and she treated me to lunch and some brainstorming. What if, we thought, she invited people all over the USA to hang shoes. What if children's "bronze" shoes appeared not just in Portland, but in many US cities; and what if people hung them and then photographed them and posted them. What if it were a Blip project? Maybe? If you're in the USA (and we figure it only makes sense in the USA, right?) and you would like to have some shoes to hang in your town, as a memorial, as a reminder--email me (my email is in my profile) and I'll give you her address; then you send her your address and a little money for postage and to buy new shoes, and she'll mail you some shoes. Then you make a photo of them and blip it, and tag it #BronzeShoesInstallation. If people comment to you about the shoes, suggest they contact their congress people and urge the incarcerated children be returned to their families. We were hearing 500 children. Now we're hearing 1600, but that's only 1600 in one place. Could there be 13,000 children detained? Unimaginable. But possibly true.